Just a couple of years ago the Gulf carriers were under attack from almost the entire airline establishment. The old network carriers, threatened by the rapid expansion into their markets of Emirates and then Etihad and Qatar Airways, used every device possible to slow the onslaught of the Middle East operators on the traditional hub system, in which the major European gateways featured strongly. The Gulf carriers were "unfairly subsidised by their governments", they were "dumping capacity" into others' markets, they "should not be granted further bilateral access"; in short they were a threat to the established world order as we knew it. How things can change in the blink of an eye. In the short space a month all three have been welcomed into the hearths of the world's biggest and oldest airlines - Emirates with Qantas (and probably soon with others); Etihad with Air France-KLM and now Qatar Airways in oneworld. It is not entirely coincidence. Once the first domino fell, it was always going to be a rush for the remaining partners. Qatar Airways' highly anticipated move to formally join the oneworld alliance firms the partnership strategy of the three major Gulf carriers as their rapid ascent on the worldwide aviation stage reverses repeated dismissal of their importance during the last few years by the same airlines that are now rushing to embrace Emirates, Etihad and Qatar. As those airlines continue to rise in prominence, oneworld is solidifying its stance that members are both flexible and encouraged to pursue tie-ups outside the grouping to enhance their respective networks. oneworld is moving to distinguish itself from its competitor airline groupings Star and SkyTeam in declaring that there is no reason why member airlines should not forge bilateral agreements with outside airlines, reasoning those external relationships help to strengthen the businesses of its respective members. But SkyTeam also appears to be softening its stance in allowing members to venture outside the fold as evidenced by the announcement on 8-Oct-2012 by Air France and Etihad regarding their new partnership that preempted by a few hours oneworld’s formal unveiling of Qatar as its latest member-elect, sponsored by BA and Iberia parent IAG. “We believe that an airline alliance that prevents its members from solving its business needs and prevents its customers from taking the most convenient path from point A to B ought to go the way of the dinosaur,” said oneworld CEO Bruce Ashby during a formal event in New York City marking Qatar’s invitation to join oneworld. That philosophy allows oneworld members to pursue outside arrangements with all the Gulf carriers as evidenced by the recent comprehensive deal reached between Emirates and Qantas, and Emirates’ open pursuit of a new tie-up with American. There were no demands made by Qatar as a condition of joining oneworld that American has to dissolve its codeshare deal with Etihad, or cease any partnership discussions it is holding with Emirates. “That’s not part of our way of doing business,” said Mr Ashby. Asked by CAPA to comment directly on how Qatar’s entry into oneworld would affect American’s relationship with Etihad and any talks occurring with Emirates, American CEO Tom Horton stated that his carrier would “have to see what the intentions of those two airlines are”, stressing one of the key factors in being a member of oneworld is that each member is allowed to pursue options that are of the greatest commercial value to that particular airline. The complexity of the new world order will undoubtedly evolve as American works its way through a very complicated bankruptcy proceeding and Mr Horton will have a long list of parties interested to discover what the impact will be - from creditors, through employee unions and even US Airways, its would-be suitor, which just happens to be a member of the Star Alliance. oneworld’s belief that each member carrier must do what is necessary to reap the maximum benefit for their business was tested in Sep-2012 when Qantas decided to dissolve its long-term joint business agreement with BA in favour of its deal with Emirates to flow traffic to Europe over Dubai instead of Singapore. The CEO of BA parent company IAG, Willie Walsh, reiterated at the oneworld-Qatar event in New York his public support of the Qantas-Emirates tie-up. He noted that Australia has and always will be a small market for BA, and remarked more value has been attached to BA’s Australian operations than was warranted due to the joint venture agreement between BA and Qantas. It was Mr Walsh's close relationship with Qatar CEO Akbar Al Baker that nurtured the deal with oneworld over the past 18 months. 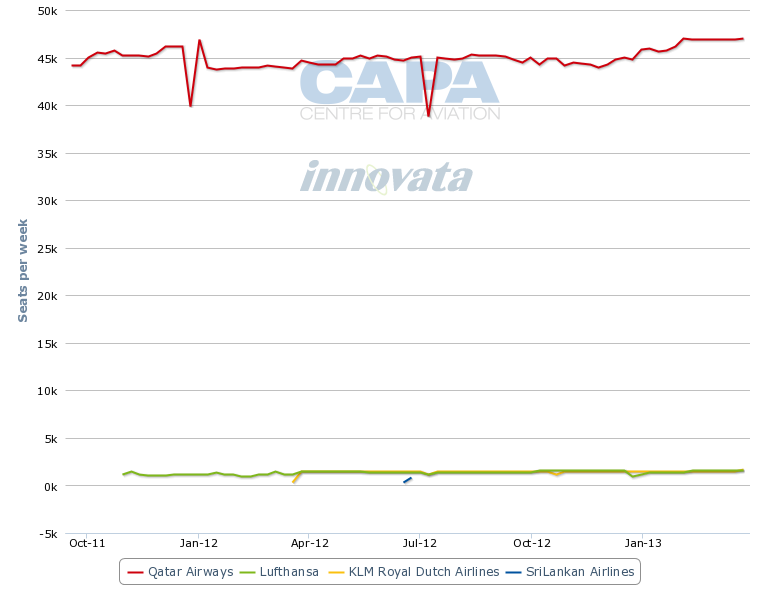 Indeed the always likely relationship may well have accelerated the timing of the other two Gulf carriers' moves. Mr Ashby remarked that the Emirates deal was essentially driven by the issues Qantas has in serving Europe, noting the Gulf carriers are best positioned to handle one-stop routings from Australia to Europe, and Emirates happens to have the greatest amount of service from Australia to the Middle East. He concluded it makes sense for Qantas to partner with Emirates, but the relationship does not preclude Qantas from working with oneworld in other regions. Coordination between Qantas and Qatar is also in the offing as Mr Walsh stressed that Qantas was a key player in the development of oneworld’s Gulf strategy, stating Qantas CEO Alan Joyce was both instrumental and a strong supporter of bringing Qatar into the group. With the mainline Chinese carriers firmly aligned with SkyTeam and Star, it appears that oneworld will opt to purse codeshare agreements with the aligned Chinese carriers even though “Star and SkyTeam frown on that sort of behaviour”, stated Walsh. He ventured to make a “bold prediction” that oneworld members will forge codeshare agreements with Chinese carriers. BA so far has encountered challenges finding a Chinese partner. Earlier this year it approached SkyTeam members China Southern and China Eastern. China Eastern's interest, however, is understood to have been faint due to limited reciprocity benefits. While it is not clear if Air France and Etihad intentionally planned to attempt to upstage Qatar’s big revelation of its plans to join oneworld, the reality it was necessary for Qatar to make a strategic move as Etihad has bolstered its position in Europe through its stake in airberlin and now with the new Air France partnership and as Emirates has closed its landmark deal with Qantas. Mr Al Baker did not outline a specific timeline of when exactly discussions over potentially joining oneworld intensified, other than stating that his carrier recently received the invitation to join the grouping. While he denies that the partnerships Gulf rivals Etihad and Emirates are forging with other global carriers had a bearing in Qatar’s partnership strategy, their moves to quickly solidify those new agreements likely played some role in the acceleration of discussions between oneworld and Qatar. Emirates offers nearly 124,000 weekly one-way seats to Western Europe, dwarfing the nearly 44,000 offered by Qatar and roughly 30,000 by Etihad. 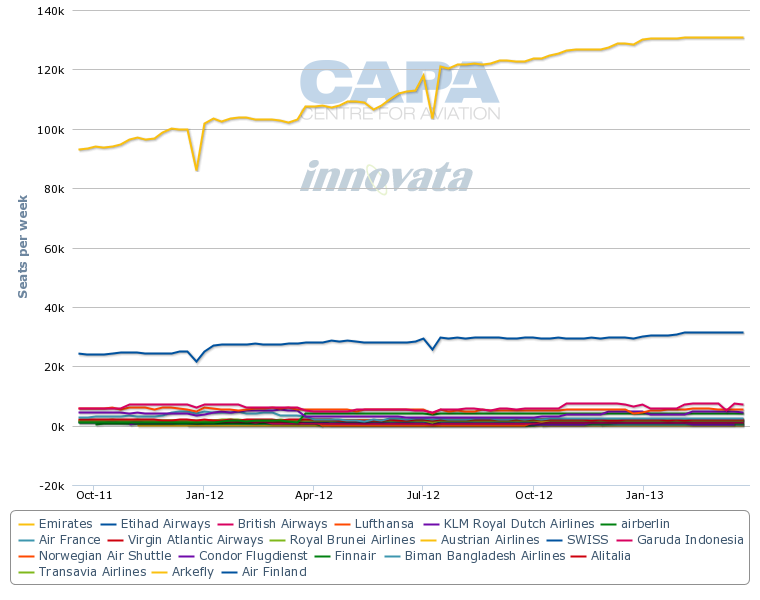 Emirates will only increase its European traffic once the new agreement with Qantas takes effect. Etihad from its partnership with Air France-KLM now has major partners in two large European markets. Qatar had no choice but to quickly forge its own plan to enlarge the viability of its network through expanding its partnerships. Qatar has taken a different approach than its Gulf competitors by pledging to join oneworld instead of forging deep codeshares or snatching up equity stakes in global airlines, and Mr Al Baker now believes alliances will remain critically relevant to the airline industry even as Qatar was denying any intention to join oneworld just days before the news became official. “We feel eventually most of the airlines somehow or another will be part of the major alliances globally,” he remarked. Mr Al Baker acknowledged that behind the scenes IAG likely had to undertake a lot of lobbying to convince some of its oneworld partners that Qatar was the right fit for oneworld. But he declared that Qatar and Emirates will continue their rapid expansion, and continuing to try and fight their growth is essentially fruitless. The push by Mr Walsh during the last year for oneworld to embrace Gulf carriers has finally come to fruition, and led rivals in SkyTeam to drastically change their view of the Gulf carriers as evidenced by Air France’s embrace of Etihad. With the new partnerships each of the three Gulf carriers for now have solidified their partnership strategy and ensured that their hubs in Abu Dhabi, Doha and Dubai will continue to grow in importance as key connection points. As an alliance oneworld is positioning itself as the most progressive, but SkyTeam also is poised to take advantage of the rapid growth in the Middle East. While Star’s position as the largest alliance globally remains intact, its insular philosophy could become more dangerous in the decades ahead. But Star Alliance remains a force to be reckoned with - it includes the world's largest airline, United, as well as China's largest in Air China, Japan's largest, All Nippon Airways, and many others. However, the shift in aviation's global balance will greatly alter the role of the worldwide alliances and has already exposed a high level of pragmatism among existing members when it comes to rushing to partner with one of the Gulf airlines. In reality, this is merely the beginning of a much wider rearrangement. Now all other airlines will have to re-evaluate their positions and look to redesign their relationship strategies. The Etihad deal announced earlier in the day included an intra-European codeshare partnership between Air France, KLM and airberlin and a more sweeping alliance/partnership between Etihad and Air France-KLM. The Air France-KLM Group is an anchor of SkyTeam while airberlin is a oneworld member since Apr-2012, but the new oneworld partner has not been getting much love from the group and will forge new ties with Air France and KLM under impetus of its 29.21% shareholder Etihad. This only highlights the often logic-defying crossovers. So, on the same day, airberlin has linked through Etihad to the SkyTeam Alliance leaders, Air France-KLM, while also becoming a partner of Qatar through its oneworld allegiance. Until all the necessary competition and other government approvals are in place and the flow-through implications evolve, there is still much left to speculation. Also, for oneworld, the specifics of the Qatar bilateral agreements with individual members are still to be worked through. But it is clear that the repercussive effect of Qantas-Emirates is resounding loudly and every major - and minor - airline will now be re-assessing its role and positioning in the overall system. There will also undoubtedly be more rounds of re-alignment at the higher levels. The announcement that Qatar is to join the oneworld partnership has come as no surprise. Long promised, despite denials from Qatar Airways' mercurial CEO, it was delayed only by the opposition of one of the alliance's members. As the momentum grew from outside, presumably that opposition melted away. Joining the loosely linked oneworld alliance is a first step only, as specific bilateral arrangemnents within that alliance must now be cemented to give it life. But the bridge has been crossed and now there is no turning back. Qatar already partners with oneworld member-elect Malaysia Airlines, which is slated to formally join the alliance at the end of 2012. As Qatar works towards formally entering oneworld in late 2013 or early 2014, it will start to forge agreements with other oneworld members and member-elects, almost certainly starting with its oneworld sponsor BA. Although upstaged on the day by Air France-Etihad, the Qatar-oneworld partnership is momentous enough in its own way. Unlike the specificity of the Qantas-Emirates bilateral agreement (which simultaneously terminated a longstanding and deep partnership between Qantas and oneworld partner British Airways); or the essentially bilateral Eithad-Air France/KLM (plus airberlin) deal, Qatar Airways is to become a full fledged member of oneworld. This means that all oneworld members - most notably American Airlines, British Airways, Japan Airlines, Cathay Pacific and (still) Qantas along with a host of smaller ones - are part of the new relationship. This hub role of the Gulf carriers, where one-stop operations between almost any two points in the world have been made possible with new long-haul aircraft, is the crux of the advantages offered by Qatar, along with Emirates and Etihad. Until now it had also been the major threat to the old system. For alliances, in particular oneworld, this type of network provides a valuable addition to their round-the-world products. Rival Star now is able to offer its passengers extensive Asia to Southern Europe and Africa connections via Turkish Airlines, which while technically a European carrier has a network and strategy that rivals the Gulf carriers. This partnership in the alliance - rather than a single bilateral relationship like the Emirates and Etihad deals - is the main differentiator. As Mr Al Baker said in the press release, "Alliances are playing an increasingly important role in the airline industry today - and that will continue long into the future. Qatar Airways has carefully reviewed its strategic options and it is very clear that joining oneworld is by far the best way forward for us as we look to strengthen our competitive offering and give passengers what they fully deserve - more choice." The distinction may eventually prove to be little more than a technicality as events unfold. Whereas Emirates and Etihad will be continue to gather specific airlines into their less formal groupings, Qatar will now go from the generic to the specific, arranging bilateral relationships. Of the global alliances, oneworld is the least restrictive in controlling outside partnerships, so there will be little to prevent Qatar from concluding any outside deals it wishes; equally clearly, some of the oneworld members will have no interest in partnering, feeling more threatened than comforted by their new partner-designate. All of this leaves one major European airline without a partner on this new dance floor: Lufthansa. As head of the Star Alliance, Lufthansa has occupied a prominent position as a network carrier, with a host of partner/satellite airlines. The carrier has actively resisted the expansion of the Gulf airlines into its territory, a fixation that may now see it sidelined as the powerful new entities line up. Although Lufthansa was courted by Etihad in 2010, senior management resisted the temptation to change course, preferring to rely on its strength in its home market and the power of the Star Alliance grouping which it heads. This may now prove to have been an awkward decision. Etihad’s first move was to partner with airberlin, right on Lufthansa’s doorstep. Now, with a promised Air France-airberlin codeshare, the foreign intrusion becomes ever more poignant. The highly pragmatic role of airberlin in this process is one indicator of just how flexible airlines are now becoming in their attitudes to global alliance membership. The Berlin-based carrier has only recently joined oneworld yet seemingly has few qualms about partnering with one of British Airways' arch rivals, Air France. For Etihad, clinching a partnership with Air France is a major coup. As Mr Hogan pointed out in the Etihad-Air France announcement, “it reflects the core elements of Etihad Airways’ 10-year master plan, driven by organic network growth, combined with the forging of strategic codeshare partnerships and minority equity investments in other airlines.” For Air France, which for years has resisted the steady inroads of the Gulf hub carriers, the agreement is more avant-garde and a next step in accepting a new world order. And now that final link has fallen into place, with Qatar finally announcing its move into oneworld. Let the games begin!